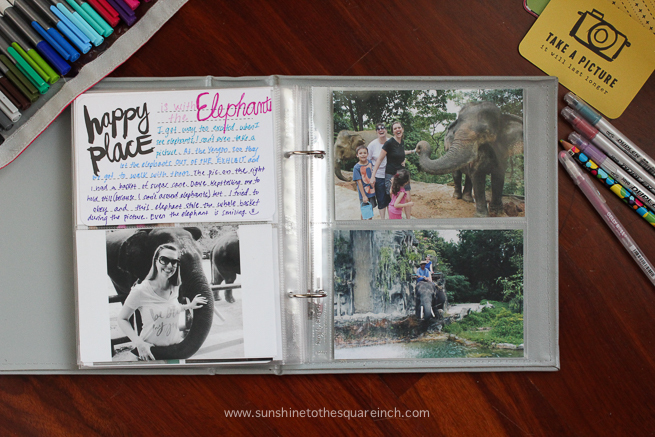 I've blogged about it before (right here) but today I wanted to give a mini update on where I am with my PL book. 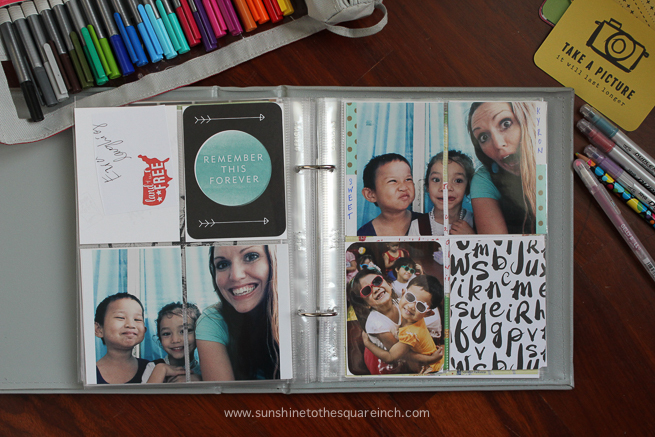 If you don't know about Project Life it is basically a super simple scrapbook and photo book combined. You can go into as much detail as you want with your PL book or keep it simple and I like having those two options. 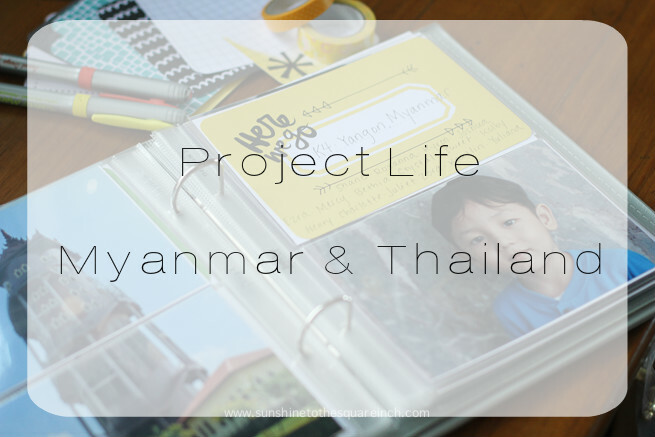 I got a PL life book to document our year abroad in Myanmar and Thailand. I kept the book pretty simple and I'm really liking how it is turning out. I have a little more to add to it so hopefully I'll be done with it soon. Teaching was a big part of my life in Myanmar and I also taught in Korea previously. In Korea I took a million trillion pictures and completely overwhelmed myself. 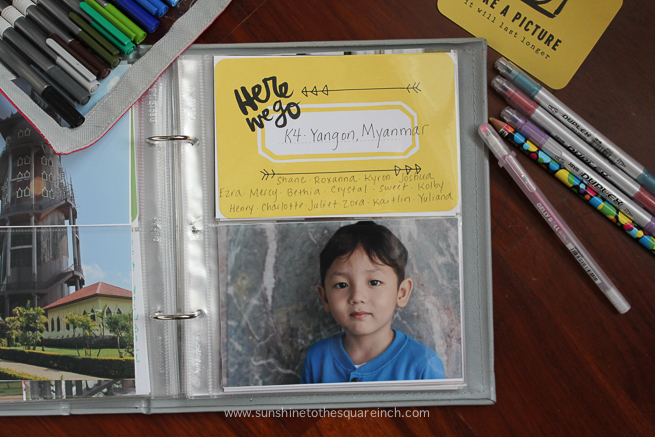 In Myanmar I tried to simplify how many pictures I took and I was selective on what I put in this book. For the book I put one picture for each child, with the exception of two kids that were cousins, I grouped their picture together. That way I will have their cute little face forever in my album and I hope it will be a reminder for me to pray for them when I see them. This big picture is of Shane and I love the card above his picture because so often Shane would say "HERE WE GO!!!" I did put a page or two of the smaller pictures and I need to add a couple of more. If you are a teacher, PL is a great way to document but not over document your life as a teacher. My 30th birthday had a few pages too! 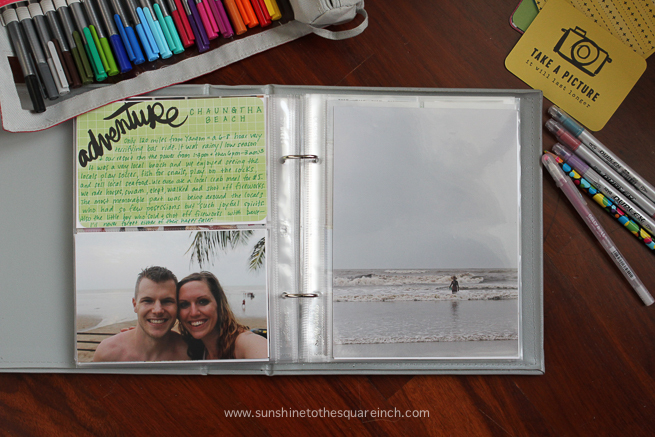 I documented our trip to Chaung Tha beach. 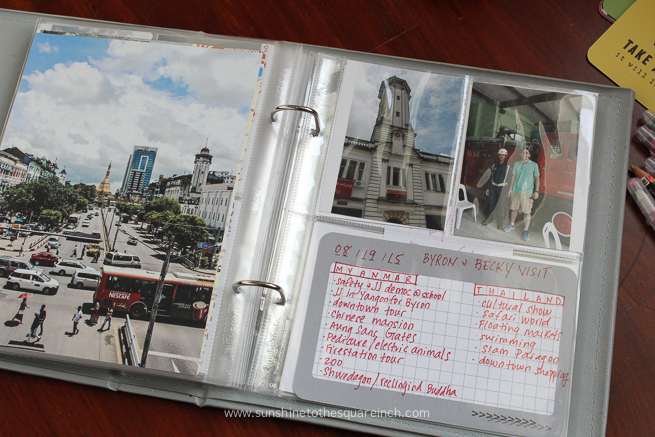 It's not anything super fancy but I do want to document and remember the places Dave and I went to. Downtown Yangon is full of beautiful buildings built by the British but unfortunately they have not been up kept over the years. Dave and I really liked downtown though and we did a few walking tours down there and we also took a lot of guests there. Something I thought was really fun was that I took the map that Dave and I used pretty much every time we needed to flag down a taxi and explain where we were going. The map is from around the area where we lived. I just cut it down into a 6x8 and then put this little card in there with some washi tape. I know in the US we use GPS mostly for maps but if you are in an airport or stop at a highway rest stop they usually have free maps and who doesn't love free??? Elephants! These had to be documented and I have my blog post almost ready to go about these guys. My parents and Byron and Becky came for a visit and I put a page or two in for each time guests came. 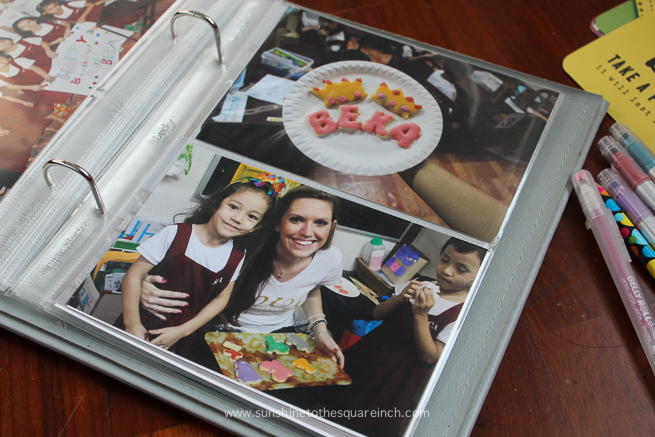 Having guests were so special and I want to make sure that our time with family and friends is documented properly. I'm really thankful I had this book this past year. 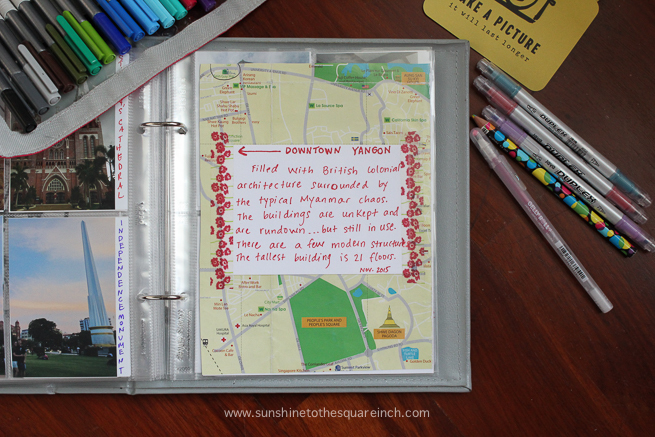 It helped me to be crafty while abroad without having to haul over a massive amount of crafting supplies. Want to know what my next fun project is? We R Memories! It's basically a mini PL but it is for 4x4 pictures. You can use your Instagram or upload your own they just have to be square. I also got the super cute travel journaling cards. This was actually a gift from my sister and I plan on documenting our next road trip using this. want to see some more PL posts? Check out Amanda's pages. She is the one who introduced me to this new fun hobby. Do you do Project Life? If so please share what you do with yours. I love seeing people's projects.